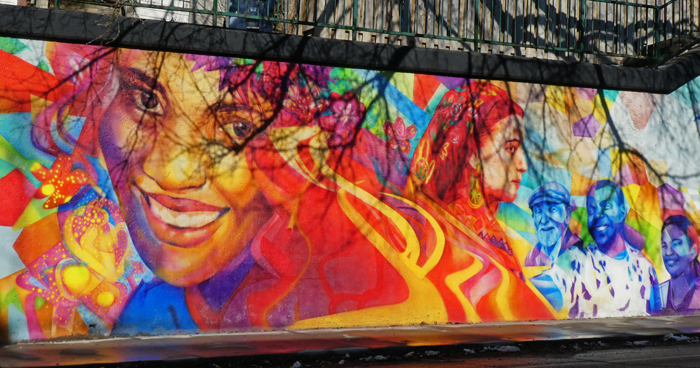 This is another section of the colourful mural by Christiano De Araujo which I showed you last Monday. How nice to be greeted by happy smiles as you go by this one. Those shadows from a neighbouring tree are always there. Pretty smile and mural. Smiles are contagious! Happy Monday, have a great day and new week ahead! Another fabulous find! I'm going to have to get busy in toronto. Another beautiful mural by the same artist. Love the bright colours Pat and thanks for contributing. Such bright colors to go with those smiling faces. I think those shadows from the tree add another element. Beautiful colours, beautiful smile. A wonderful mural, Pat. What a great mural. Christiano De Araujo is highly talented. Love the bright colors. I really like how he uses color. He's quite a gifted artist. You can't help but smile looking at this one! I hope this trend to murals in cities spreads. It enhances what is sometimes an otherwise dull urban scene, especially on a grey day in winter. Thank you, everyone, for the positive feedback and comments on our 'See The Forest for the Trees' - Rogers Road Mural Project, this mural was made possible by the support of StreetARToronto (StART). Designed by Natasha Dichpan, Produced and Painted by Christiano De Araujo, assisted by Natasha Dichpan, Curtia Wright and Kayla Whitney.